Fire Projects supply, install, test and commision microprocessor based manual alarm Control and indication panel, which is designed to individual zoning the fire input and evacuated /alert fire in earliest practicable moment with the help 24 V hooter output. The panel operates on 220 V AC Mains with 24 V DC Battery as a standby power, the built in circuit provide constant voltage charging to maintain the battery capacity. Fire alarm control panel available in different varient starting from 2 Zone, 4 Zone, 8 Zone and 16 Zone. Fire Projects has installed many fire alarm control panels, For small office where smoke detector, heat detector or multi detector required in less quantity Agni Fire Alarm panel is suitable, reliable and economical choice of client. Fire Projects recommend to use 20 to 22 smoke/heat detector in each zone to get best perfomance of agani fire alarm panel. 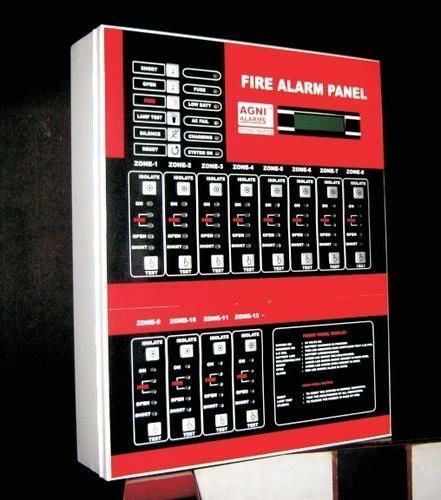 For low cost convetional fire alarm solution, Agni fire alarm control panel is preferred choice of customer.